Our walkthrough posts and leaderboards are live! Just downloaded this on iOS today. Tried to play the new levels, but when I click on level one, app crashes. iOS 8.4 on iPod Touch 5 (will not upgrade). Happens to me often. Try a hard reset. Lock and home keys til the screen goes dark then displays the apple logo. 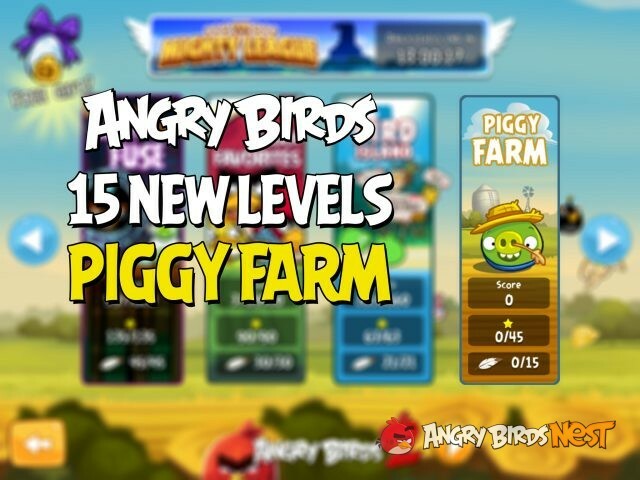 The whole Angry Birds franchise is all about farm animals about birds and pigs ? Didn’t George Orwell write a book about this? This episode has Cutscenes! Although they have the birds in their Toons design. Also, after completing level 1 and the score screen showed, the stars’ sound is changed with the ABSpace one (I don’t know how to explain it). As the piggy farm update. The birdday 5 episode is located to birdday party episode. Downloaded the update and played a few levels. They are fun. Like getting back to the old game play. Just want to say “Thanks” to the Nesters that took the time to do the walk throughs on these new levels. And for maintaining this site. Thanks for all you do! So … no Golden Eggs (yet)? OK, now there’s a Golden Egg after the update. Note: the new Golden Egg is on the third page of the Golden Eggs menu. I haven’t been on here much, because I have been taking care of my 86 year old mother for a few years, but I thought I would pop in to say I really like this update! I don’t have as much time to play AB any more, and mostly just play ABO, Seasons and Rio. I like the classic gameplay of these, and figuring out the best strategy for getting three stars and Total Destruction. For me, now I use AB to just relax, or something to do while sitting in waiting rooms and things like that. It was really nice to have some new levels to play instead of playing old ones over again! No way to attain total destruction on level 7 seemingly. Probably will be fixed in an update but I think the eggs count for a lot of points and it’s too difficult to destroy all of them with the eagle. They just bounce off the birds. @ineptidude It IS possible to feather this level. I feathered all 15 levels today and they’re not that hard to feather. It’s like you said, the eggs play a major part in achieving 100% destruction. Quick question. 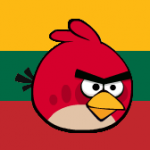 Why did the star get sound change to the angry Bird space star get sound? Because this year the angry birds space turn 5 ? would be fine if i could zoom out the screen. I barely see the launcher. Cant launch the birds with any velocity. It was a problem with a game. From the new update, are the coins new? I know the gems are new, but I thought the coins were always there (like ABSeasons and ABStarwarsII). Great!! Previous levels were enjoyable!! Aaand they ruined another game with unnecessary currency. Great. So … a prehistoric theme? Time travel (think PvZ2)? Anyway, please don’t put yet another Golden Egg in the Mighty League. Well, that was too easy. After 3 starring the previous 30 episodes without resorting to the walkthroughs, I 3 starred the final 15 in about 3 hours without help. What’s with the coins and jewels? Can’t use them in any other level. Still using same scrolling menthod, quit playing. There is no space on sligtshoot, cause too often miss fire. also if you beat the level with stella left, it won’t give 10000 point. Oh it was mentioned, sorry. Uh oh… Foreman Pig is escaping in a time machine!